This week, the farmer’s markets were just teeming with people and chock full of wonderful strawberries and spring vegetables. I didn’t buy as much at the market as last week because we now have our weekly Produce Box delivery. Still, it was great to be out seeing the farmers so busy after a quiet winter. Our total for the week was $101.65–just $1.65 over our weekly goal. Not too bad!! Have a terrific and delicious week! I love the idea of a traditional CSA, where you arrive at a meeting place, wait with other earnest, veggie loving people, and leave feeling virtuous with a box of farm fresh produce. The trouble is, I am a terrible CSA participant. Terrible. Pickup day arrives and I invariably have a late meeting scheduled or I get stuck in the carpool line (it’s not a social gathering, Mrs. Volvo Station Wagon!) or…I forget. Most often, it’s the latter. I’m half way to the gym and realize…*@&!$%…veggies! And “resentful” isn’t the way we should pick up our fresh veggies. That just seems so wrong. So, a friend and neighbor introduced me to The Produce Box. I love those people, I tell you. Rather than waiting with a tapping foot for me to come screeching around the corner, they patiently pack up my order and deliver the veggies to ME! I didn’t realize anyone did that anymore. According to their website, they are “a network of families, farmers, neighborhood moms, and others who all share a common vision–growing and eating food that’s good for you and the planet, from people you know.” I think of them as the “veggie fairies,” but whatevs. 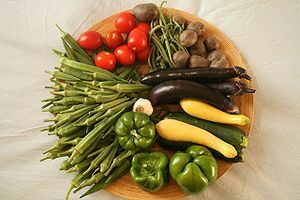 Each week on Friday, you receive an email detailing the standard (default) box of veggies as well as several alternatives, including an organic box, a fruit box and so on. Each box is about $23.00 and you pick whatever you want or bypass that week altogether and pay nothing. By Sunday night, you go into your account, pick your box for the week, plus any additional add-ons. If you’re like me and you forget, you automatically get the standard box (it’s like they know me). This fall, add-ons included local bread, honey, preserves, apple butter and cheese. Your account is charged when your order is filled. Wed or Thursday, a box of your beautiful, locally grown vegetables and other items arrives on your doorstep. Voila! No forgetting! No speeding down the highway after a long meeting to get to a pickup location! I say, “voila!” like this is an easy feat. Really, the entire production depends on a LOT of very dedicated farmers, volunteers and part time employees. I don’t know them, but I love every single one of them. The vegetables we have received have been unbelievably wonderful, very fresh and of excellent quality. The board surveys members in the fall and works with local farmers to plant crops that members have interest in. Pretty cool! It may be cold and rainy outside, but I’m thinking spring!